If you're after a big sandwich this one will hit the spot. Big juicy fresh cooked schnitzel with vine tomatoes and crispy bacon. Expect to sell hundreds per day. Slice the chicken breasts in half and flatten with a meat mallet. Dust the chicken with flour, dip in the egg and then toss in breadcrumbs. Deep fry at 160C until cooked through and golden. Drain. Slice and toast or lightly grill the Turkish rolls. 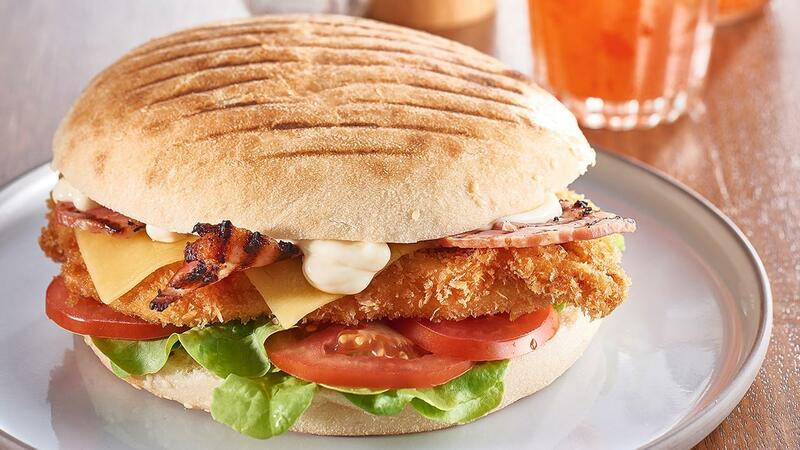 Bottom bun, lettuce leaves, tomato, chicken, cheese and bacon and top with HELLMANN’S Deli Mayonnaise. serve. Crumb your chicken using Panko Japanese crumbs it gives a better texture and crunch.